This was the message that pediatrician Dr. Dipesh Navsaria shared with a room filled to capacity with librarians, early childhood educators and even law enforcement at the Beloit Public Library in Beloit, WI recently. 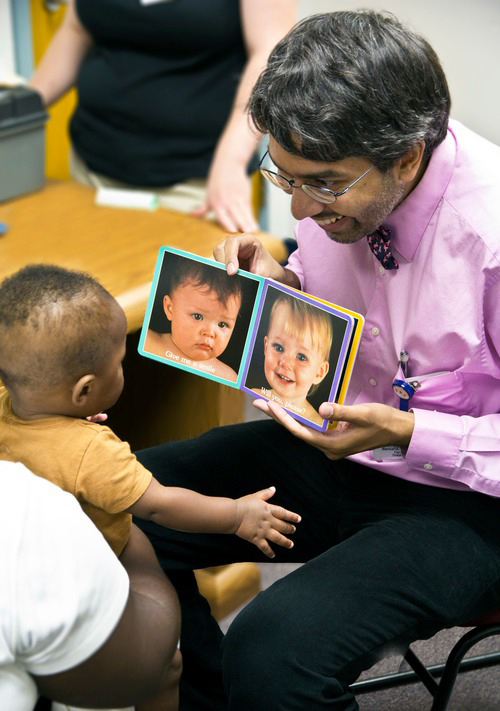 With a background that includes degrees in public health and library science, Dr. Navsaria understands the importance of agencies integrating early childhood education with clinical health initiatives. Although those who serve young children in their community can’t control some of the factors that affect a child’s development, said Navsaria, they can help control other factors and counteract the effects of the ones they can’t. Libraries and other community organizations, along with programs such as Head Start, can have significant positive impacts on early development. These organizations provide opportunities outside the home for infants and toddlers to experience the positive effects of reading, talking, singing, and playing — activities that help build connections in a child’s brain, which has an intense period of growth from birth to age 3. According to a recent study, children who are read to regularly exhibit higher activation in areas of the brain that support mental imagery and comprehension of narratives — key skills needed for independent reading comprehension. When children are not given opportunities to experience language through books and other interactions, a disparity develops. The 30-Million Word Gap Study, which focused on vocabulary acquisition, found that children in families on welfare were exposed to 30 million less words by the age of 3 than children in affluent families — a striking imbalance in a skill that helps to ensure later reading success. There are many factors that influence a parent’s ability to help his or her child develop vocabulary and other early literacy skills, including a parent’s own educational level and access to basic needs, a stressor for many families living in impoverished circumstances. While all children experience stress, many children in low-socio-economic environments are subject to extreme negative stressors, including some form of neglect. The lack of a positive environment can have shocking effects on development. Dr. Navsaria illustrates the effects with a brain scan of a 3-year-old who experienced severe emotional neglect in contrast with a 3-year-old who experienced normal development. Stressors can be categorized in 3 different levels, explained Navsaria, and while a limited amount of stress is tolerable and could even have positive effects, it’s the third level below that affects a child’s development. Positive: For example, a parent leaving on the first day of preschool. This produces a normal short-term response, which is alleviated by a strong support system and strengthens a child’s ability to adapt to changing circumstances. Tolerable: For example, a death in the family. These are serious stressors, but when they are buffered by strong, supportive relationships, long-term effects are not necessarily significant. Toxic: For example, child abuse or homelessness. Much like tolerable stress, these are major events; however, they are prolonged stressors that have limited or no supportive relationships to combat them. The toxic stress that many children in poverty experience has “persistent effects on the neurological and endocrine system,” said Navsaria. The myriad negative outcomes include decreased coping skills, poor memory, anxiety, impulsivity and changes in the brain that lead to a chronic state of fight or flight response. 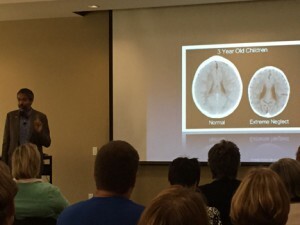 Traumatic childhood experiences affect not only the brain, but also a child’s overall health and have long-term consequences into adulthood. As the Adverse Childhood Experiences Study shows, these negative health effects are not specific to children in poverty; all populations broadly experience them. The study included 17,000 participants from (notably) middle-class backgrounds and provided overwhelming proof that traumatic childhood experiences are directly linked to developmental delays, chronic diseases, depression, IV drug use, alcoholism, adult heart disease and early death. But what role do libraries play in helping to combat the consequences of adverse childhood experiences? Practitioners who interact with young children can influence powerful change in a child’s life in a number of ways. Libraries provide free, safe environments that offer repeated exposure to positive interactions during those critical years from birth to age 5. Diverse storytimes, access to books, art activities, family areas with opportunities to role play, build and discover — all of these things foster brain development and early literacy and math skills. 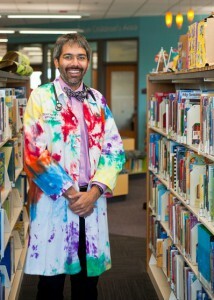 One of the most important experiences that libraries provide is an opportunity to develop a love of books and reading. Why is reading so important? Because “it’s the fundamental skill for learning,” said Navsaria. As with medical health initiatives, “early childhood interventions need to start early to have the most profound effects,” said Navsaria. “One-third of children enter school unprepared to learn. We can fix the achievement gap if we figure out how to intervene in the first 1,000 days of life and continue to support it later.” That’s why library programs such as 1,000 Books Before Kindergarten are so significant — these simple interventions in the earliest stages of life can help prepare children to enter school with the skills they need to succeed. We often think of reading to a child as a natural skill, but many parents are reading to their very young children the way they’ve been taught to read aloud in grade school, causing them to struggle with the contrast between the child’s natural curiosity and their belief that the child should sit quietly and listen. The more impoverished the family, the more likely they are to be authoritarian in their interactions with their child, said Navsaria. Navsaria recalled a memorable clinic visit with a woman and her child who were living in a homeless shelter. After handing the infant a book to play with, Navsaria observed, “Look how much he’s loving that book!” The mother’s face broke into a smile as she exclaimed, “My baby’s smart!” Simple interactions such as these, notes Navsaria, can help alter expectations and break the cycle of underachievement. Through storytimes and programming, librarians also can educate parents and caregivers on the value of encouraging free play — allowing their baby to follow his or her natural curiosity instead of correcting or directing their child. By verbally responding to babies during playtime and allowing them to explore their world safely, infants develop curiosity, persistence, fine-motor skills and vocabulary — important skills that build a foundation for later academic success. It’s making these connections between community resources — libraries, welfare and early childhood programs, and clinics — that can make real-world differences, stressed Navsaria. It was clearly a message that resonated with his audience, as spontaneous discussion broke out among the attendees about ways they could connect with other organizations in their communities to best serve the youngest population, including connecting early literacy with adult literacy programs, working with healthcare to send books home with new mothers, collaborating with universities and education students, and utilizing current volunteer programs. What are some new ways you can leverage resources in your community to make a difference in the lives of children? Share your ideas and experiences in the comments below. I’m glad you enjoyed the article. Thanks for keeping the conversation going!